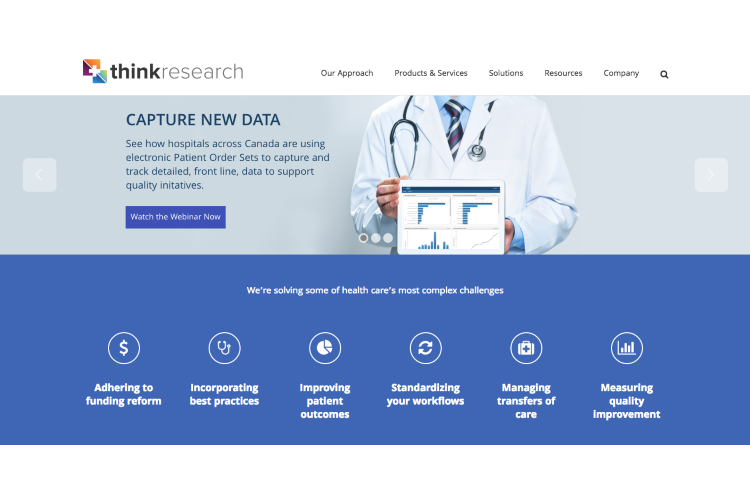 Think Research is a Canadian healthcare software company that develops knowledge-based tools that empower clinicians to deliver the best evidence-based care to patients, driving better patient outcomes. The dedicated development team at N-iX is involved in a step-by-step software product development for Think Research. During the partnership period, N-iX has provided deep domain knowledge and professional development skills to achieve the client’s business objectives. Aimed at the North American market, these Canadian healthcare software solutions are now used in over 300 healthcare organizations. N-iX supports Think Research’s efforts to improve their existing products and create new point-of-care, clinical decision-making tools for the healthcare industry. The team provides software development services for a number of applications including EntryPoint, MedRec, ProgressNotes, Spotlight, eForms, PatientPortal, and Virtual Care. Think Research is a rapidly-growing healthcare software company based in downtown Toronto. EntryPoint is a privacy-compliant cloud-based platform that supports Think Research suite of healthcare applications. With EntryPoint, patient information, documents, and software applications are easily accessible with powerful search tools and smart, user-specific workflow adaptations. Applications hosted on EntryPoint pull in and pre-populate important patient demographic information, adding powerful new capabilities to existing information systems. Being a cloud-based platform, EntryPoint is connecting all corners of the healthcare community. Users can access EntryPoint and its applications via any web-based device, anywhere and anytime. With the real-time data collection capability, you can track, measure and analyze trends in your practice with an unprecedented look into clinical practices.